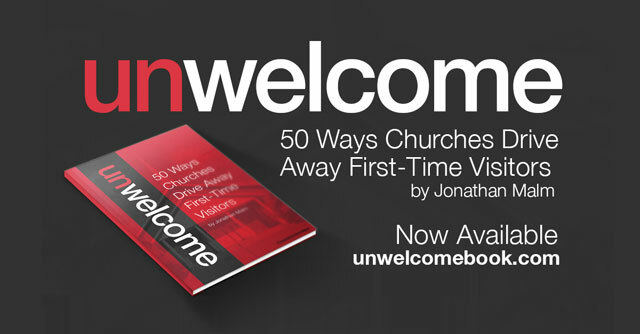 We’re super excited to announce the release of Unwelcome: 50 Ways Churches Drive Away First-Time Visitors by Jonathan Malm. This is a great resource to help churches get a handle on how to welcome visitors. Jonathan tackles 50 ways churches can creep out visitors and how to fix those problems. Plus the foreword is written by Kem Meyer. What’s not to like? Need to know more before you buy? OK, we can help. Check out sample chapters at UnwelcomeBook.com to get a taste before you buy. Read Jonathan’s post about the Sunday Sneeze to learn more about the philosophy of welcoming visitors. Want more help with visitors? We’ve recently talked about how make sure your website and visitor cards are welcoming. We’ve also got a whole page of resources for reaching out to church visitors. With all 50 church faux pas, Jonathan suggests ways to not only fix the problem, but also infuse excellence into the situation so churches can put their best foot forward with first-time guests. A few simple changes can help your church roll out the welcome mat for your guests. What Do Smart People Think of Unwelcome? Visit UnwelcomeBook.com for more rave reviews.